One of my favorite ways to add a fresh and bright feeling to our home is with flowers. Sometimes they are real, like my new love of carnations, and sometime they are fake, hello easy no fuss greenery! Adding that gorgeous floral touch can also be as easy has hanging a wreath on your front door to greet you and your guests. And you know what else? Wreaths don't have to only go on the door! Place one as the centerpiece on your dining or coffee table. Hang one over a mirror to double the floral love. Or, hang one on the wall over your bed to add a touch of bright color to the room. 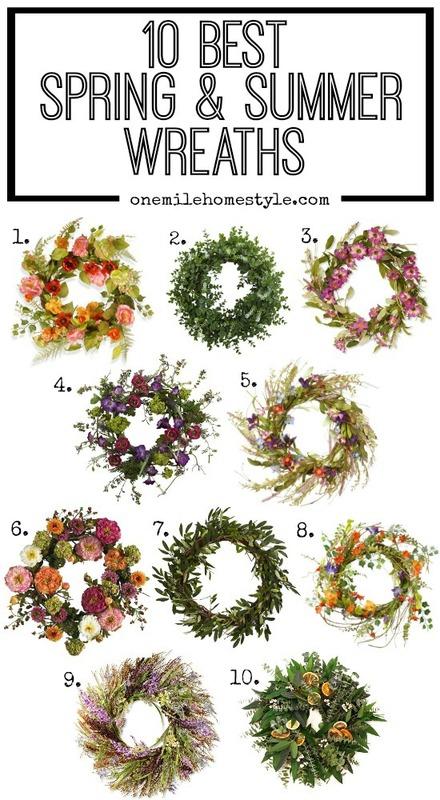 Here are 10 wreaths that are perfect for adding a little spring and summer color to your home! This post contains affiliate links for your convenience, you can see my full disclosure here. Which one of these would you love to see on your front door this year? Ah, I so could have used this post a few days ago! I was looking for a wreath to send to my mom as a gift, and I had a harder time finding one than I anticipated! You picked out some beautiful ones for this post!